Summary: St. Joseph Peninsula State Park (SJPSP) is an ecological hotspot in the Florida panhandle, and is home to a multitude of imperiled species. Not only does it have the highest nesting density of sea turtles in the panhandle, it also has a majority of the snowy plover nesting in the state, along with the highest density of St. Andrews beach mice. On top of this, extensive shoreline erosion has caused a majority of the beach to be impassible with a vehicle. To accommodate the multitude of imperiled species at SJPSP along with the erosion, sea turtle surveys are going to be completed in 2017 by walking interns and volunteers instead of driving on the beach. In order to do this, a UTV capable of holding three people will be purchased to drop turtle surveyors at different points inland (off the beach) so that they can walk specific sections for their survey. The purpose of this project is to reduce the impacts of beach driving is sensitive habitat, while maintaining the integrity of the index surveys. 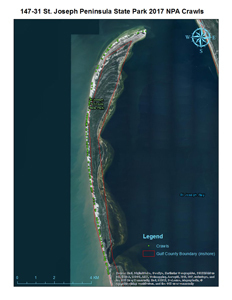 Results: The UTV and GPS units were purchased and intern housing was secured at the St. Joseph Bay State Buffer Preserve prior to the start of sea turtle surveys. Four student interns were selected from FSU, trained, and conducted daily nesting beach surveys in St. Joseph Peninsula State Park.